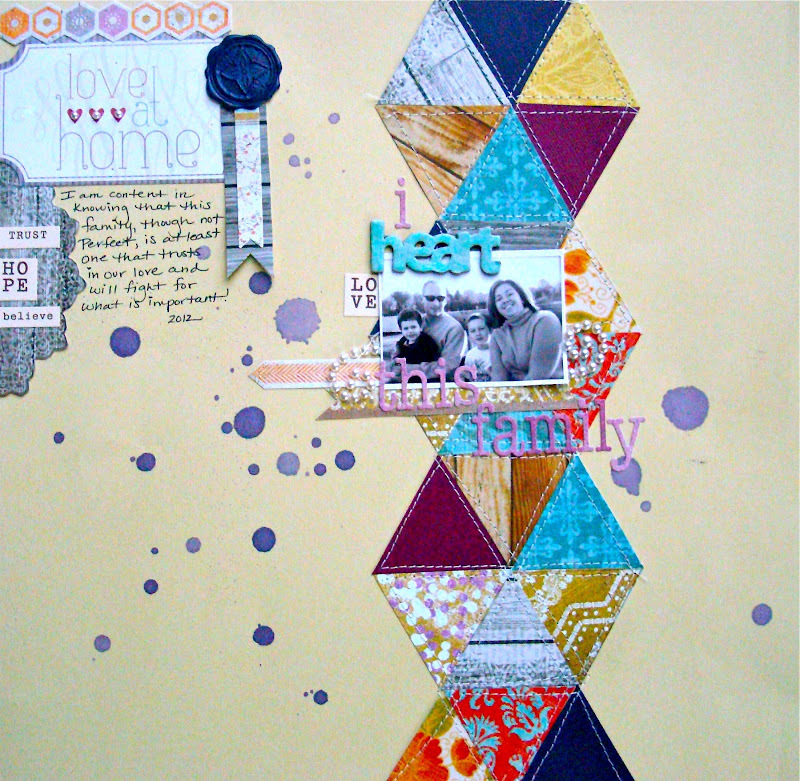 I have another layout to share from the April Scrapbooking From the Inside Out kit entitled "Contentment". I love this kit and it's colors and patterns! I was inspired by a quilt that I found on Pinterest here in creating this layout. I wanted a homemade, stitched look to symbolize family closeness. The patterns in the papers are rich and work so well together. I love the textures and contrast they provide. Here are some shots of my layout. This little beauty of a chipboard word was perfect to add to my title! I colored it with metallic green Gelato from Faber-Castell. Here's my version of the quilted paper element. 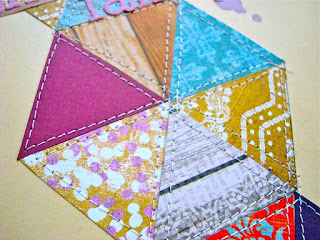 I cut 4 hexagon shapes from different papers and then cut them into triangles to mix and match them. Some of the papers are double sided so I had more choices too! 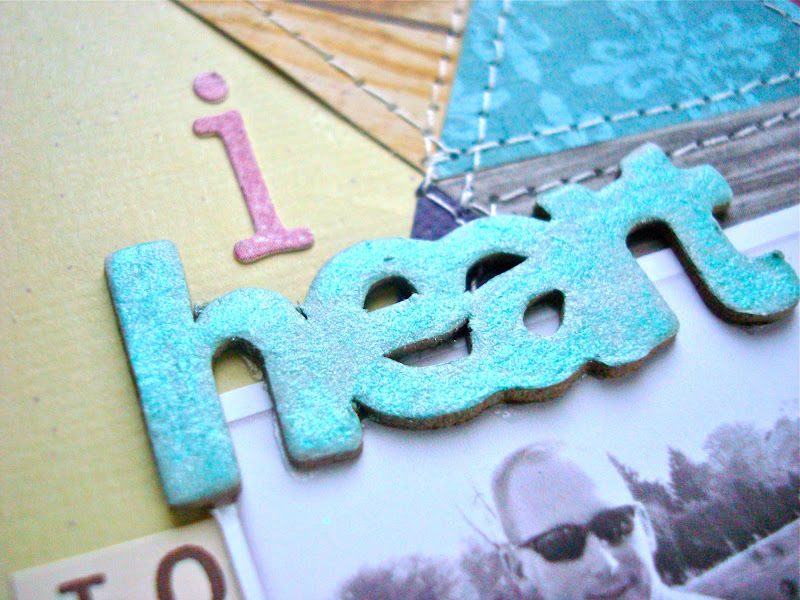 Once I glued them down lightly, I used my sewing machine to stitch them onto my paper. I used Smooch spray and dripped it onto my paper. I sprayed some on a transparency (or packaging) and added a bit of water to make them drippier... then I turned it upright and allowed it to drip where I wanted them. 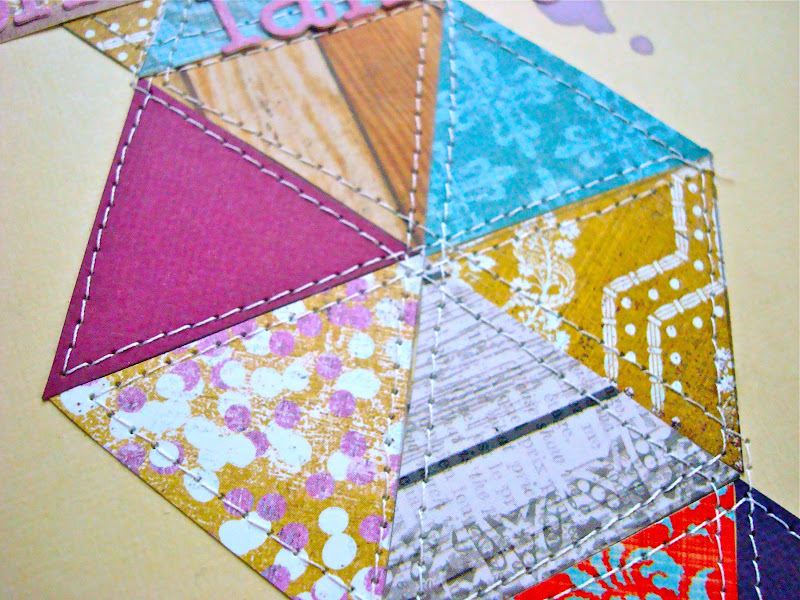 The paper doily from the My Mind's Eye paper was just too awesome not to cut out and use! I also used the tag in the upper corner. 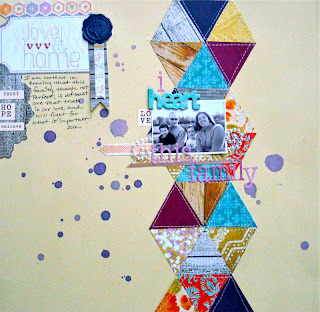 My journaling tells of an imperfect family but one that sticks together and loves each other! Here's my final page! I really love how it turned out... If you need inspiration, check out the Scrapbooking From the Inside Out site and Pinterest to get ideas that might reflect on your pages! Hi Jen! Love how this page turned out! You've certainly pulled off the stitched quilt look...so cool!